Ages 5 and up. 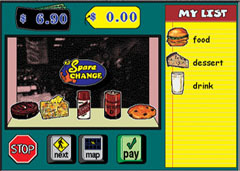 Students learn to count and use money and learn to make change using this CD-ROM program. The program is divided into three levels and includes colorful graphics and human quality speech. Requires Macintosh system 7 or higher, Windows 95, or Windows 98. If you are using a Macintosh computer with System 7 or higher, you can save money by purchasing the program on disk rather than CD. To order the program for MAC on 3.5" disks rather than a CD, click here.